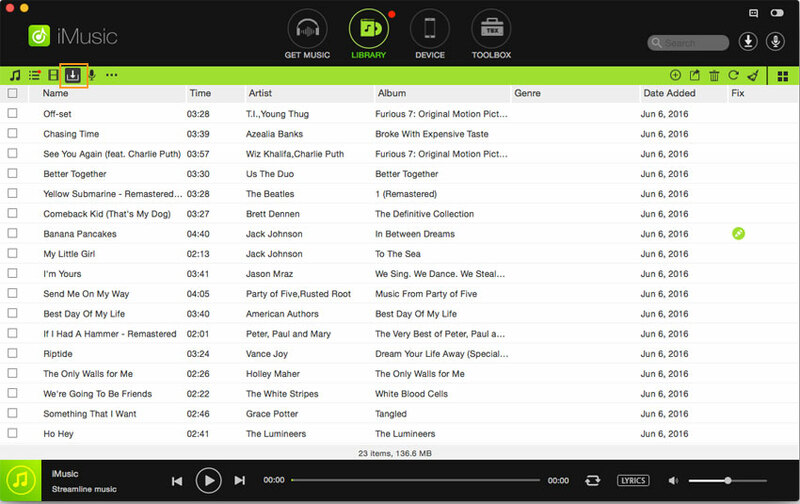 Spotify allows users to download music only when opting for a monthly subscription. They even receive the chance to save their favorites in offline mode to listen later. However, music lovers now have an enthralling way to download Spotify music without the necessity to opt for the Premium version. The endorsed software for downloading music from Spotify without paying a penny is iMusic. The application is a platform for music lovers where they can download, transfer songs between computer and iOS/Android handsets, between iPhone/iPod/iPad and Android devices, remove duplicates, and clear widespread collection of music. iMusic delivers the needed option to save songs from Spotify in two different methods. 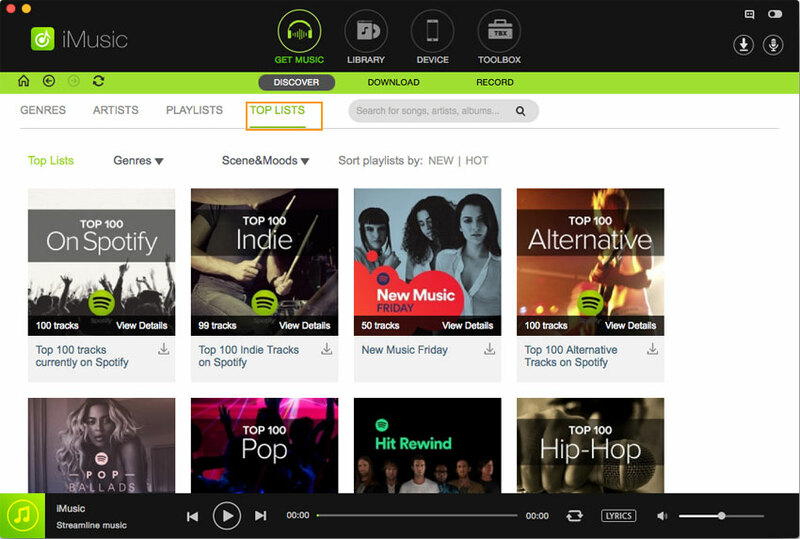 The continuing passages will present information about the two processes that will help you in downloading Spotify songs without opting for Premium. As stated, iMusic has an in-built library with tens of thousands of songs, which a user can find under the Discover feature. 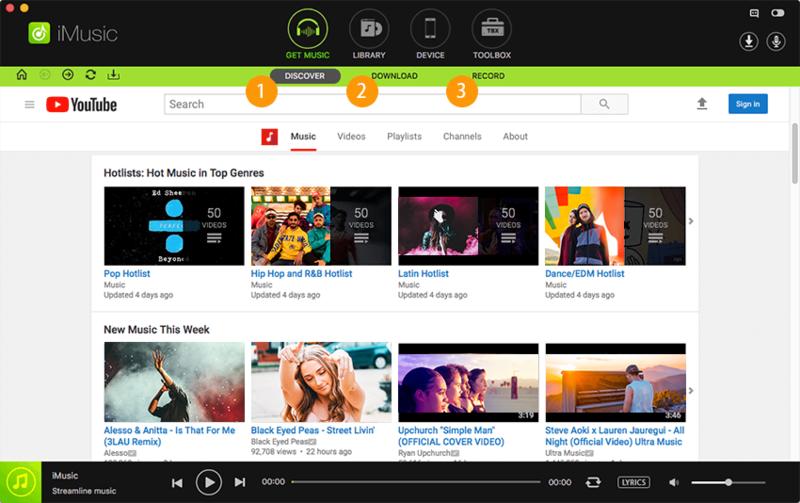 They can search for a song, an artist, an album, a playlist, or the latest trending songs with the powerful search box. Step 1: Install iMusic software on your computer. Choose the trial edition offered by aimersoft. After completing the installation, start the program, and tap “GET MUSIC” from the menu bar. From the sub-menu, choose the “DISCOVER” feature. 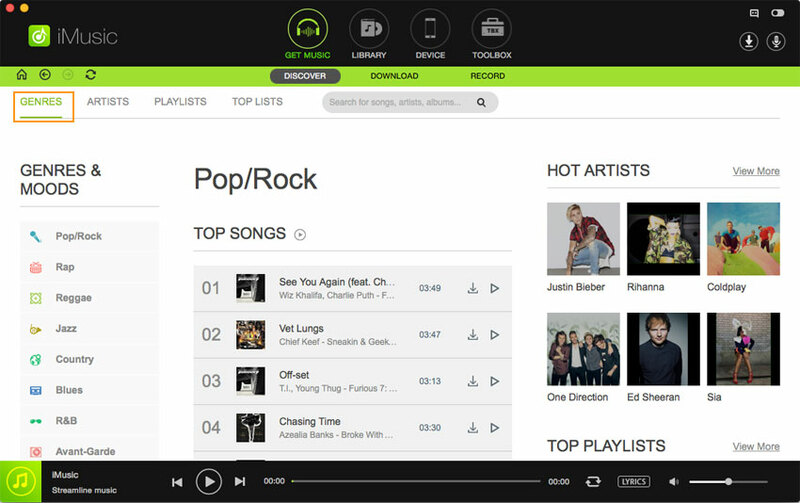 Step 2: From this window, you can begin searching for a song using genre, artist, playlist, and top list. You can further use the search box to find a song directly. For each entity entered in the box, the software will display the hottest song, artist, playlist or genre automatically. To choose GENRES, press the GENRES tab and pick any of the listed formats. For ARTISTS, click the ARTISTS tab, and you can browse artists according to alphabetical order or click the HOTTEST ARTIST for the current trending artist. For happening PLAYLISTS, press PLAYLISTS tab and you will notice the lists arranged according to type, scene, mood, and top list. You can download a playlist from here as well. 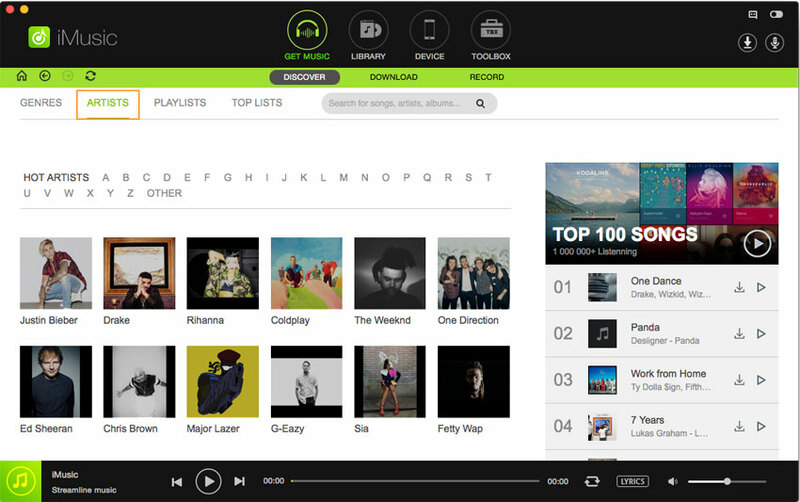 Press TOP LISTS to choose the top lists from Spotify and other music streaming websites. 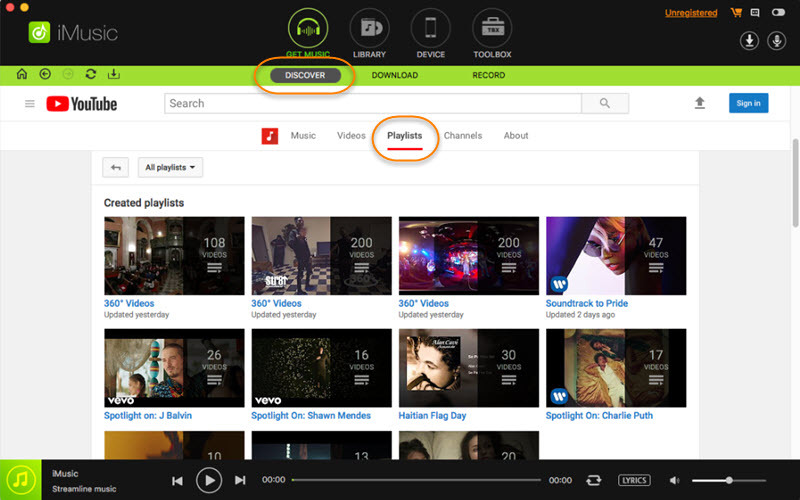 Step 3: Click the play button to open the songs within a playlist. You can select all the songs, or choose a few, and press the download button to save them to the computer. Step 1: Launch the iMusic software by clicking the icon on the desktop. From the menu bar, tap “Get Music” option, and tap “Download” choice from the sub-menu as shown in the figure below. 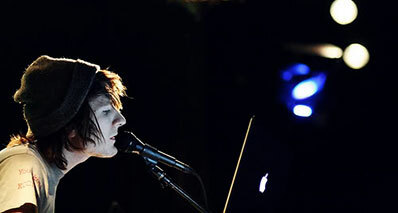 The window will contain an URL paste box along with direct access to some of the music streaming websites. Step 2: Open Spotify site using a browser. Search for a song, artist, or playlist. Copy the URL of the same from the site. 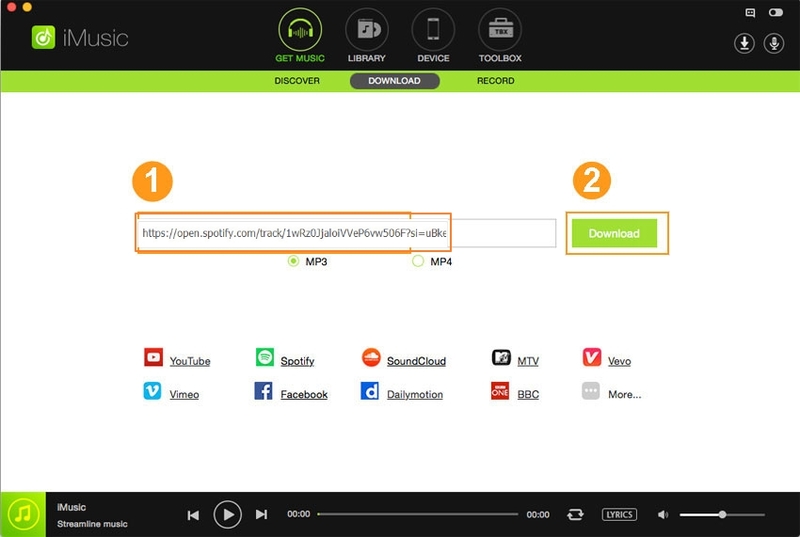 Now, paste the copied URL from Spotify website in the URL paste box within the iMusic application window. Select the output according to the requirement, and click Download to save the file to the computer. Step 4: You can furthermore gain access to Spotify directly by clicking the website from the link provided within the window, and search for the song using the search box. You can then choose the quality and output format, and press the Download button to save it to the computer. Step 5:iMusic will save all the songs in the library automatically, which you can access by clicking the Library tab from the menu bar. 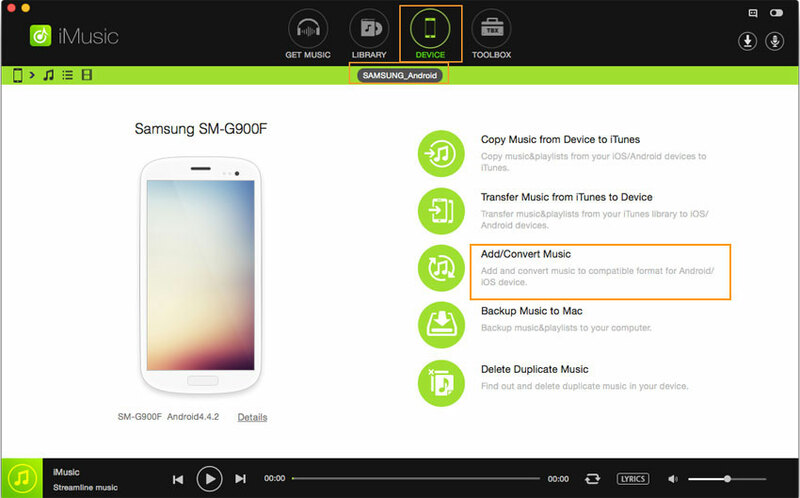 Of course, transferring music to an Android phone is simple. However, if the songs are not in the format as supported by Android, then you need an additional method that will help you transfer the downloaded Spotify music to the preferred Android phone. 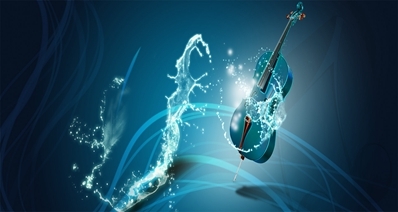 The method that you are going to talk about is by using iMusic. 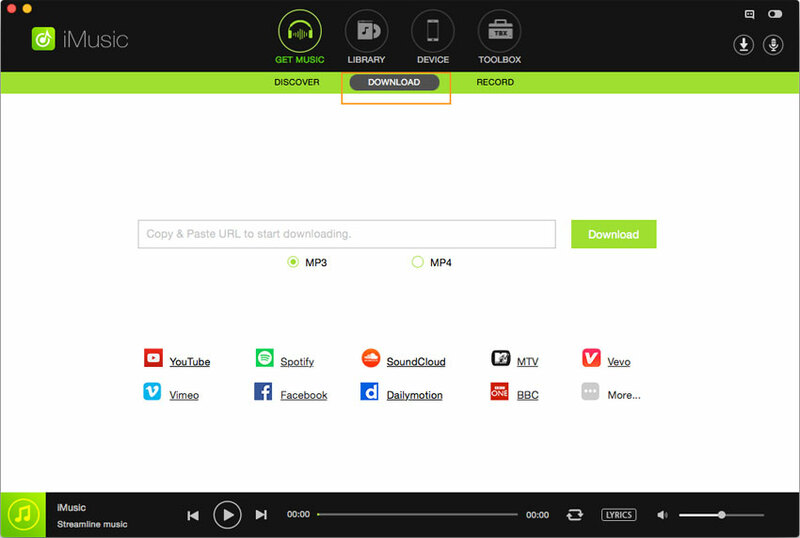 Step 1: The basic procedure involves downloading the trial variant of iMusic from the aimersoft website. After installing it, run the program, and then connect the Android phone to the computer using the preferred USB cable. iMusic automatically detects the presence of the device and will display the information under the “Device” tab. 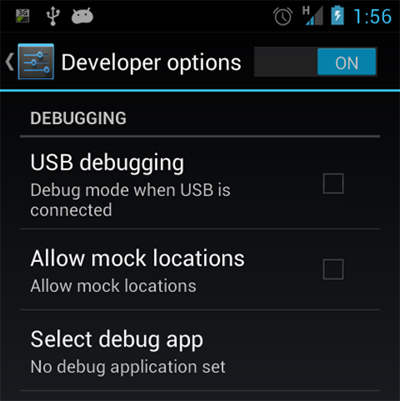 Note: Enable USB debugging mode if you are unable to see your device in the display window. Step 2: From the presentation window, tap the music icon that appears in the left corner of the submenu. 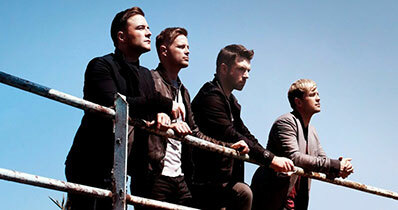 It will open up the list of the songs are available on the device. To add the downloaded Spotify songs, you need to press the “plus symbol,” which can be found on the right side in the submenu as shown in the picture below. Clicking it will open a new window where you can navigate to the songs downloaded from Spotify using iMusic. After making the selection, press Open to add them to the Android device. If you are using a Mac to transfer the songs to the Android device, you have the option to “Add/Convert Music” feature. Clicking the feature will open a window that will allow you to browse songs on the Mac. 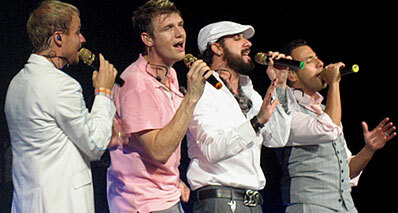 The same function will also convert the songs into a format recognizable and playable on an Android device. You can select individual songs or an entire folder. 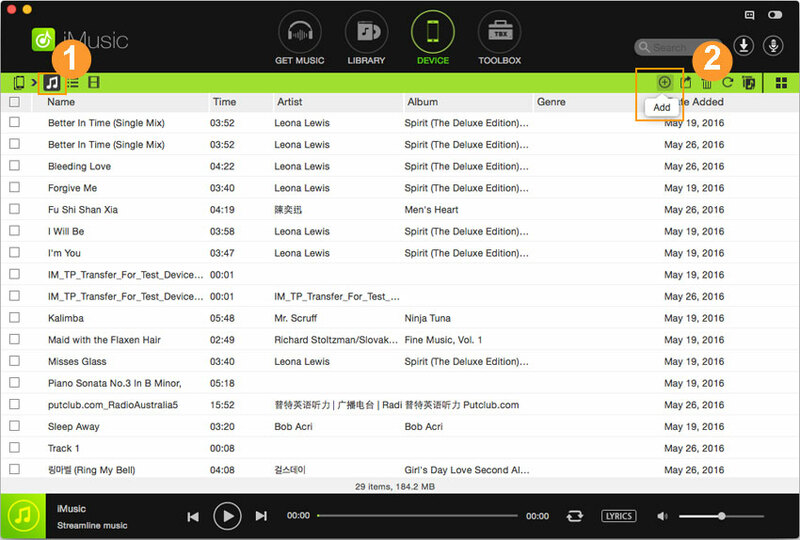 You can also browse iTunes library and select the songs to add them to the Android device. Is It Legal to Convert YouTube to MP3?